The modern facade has the basic form of a conventional family home due to the peaked roof, two levels, front facing windows and small balcony. But it's also a home with a unique and elegant spirit. The windows are large and trimmed with fine lines that give the home a very elegant look. Note the unique entrance area that we will explore in more detail later. Also, it's interesting to note that the property is set on a corner block. This can create issues of privacy and noise in dense urban areas. 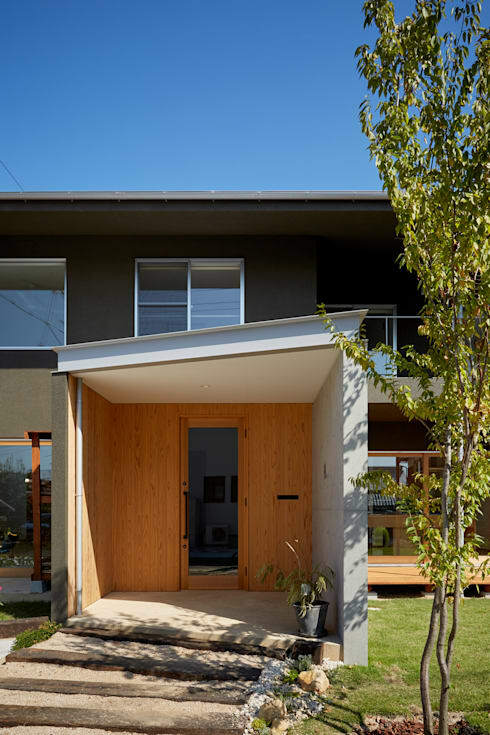 But here in this semi-rural area, the architects have used this extra street frontage to create a side entrance and a garden in two parts. The unique entrance area has been extended and shifted to create an unusual shape. This doesn't just give the facade more shape and character. It also serves to create privacy and provide a wind-break. This is possibly an issue on a corner block like this. 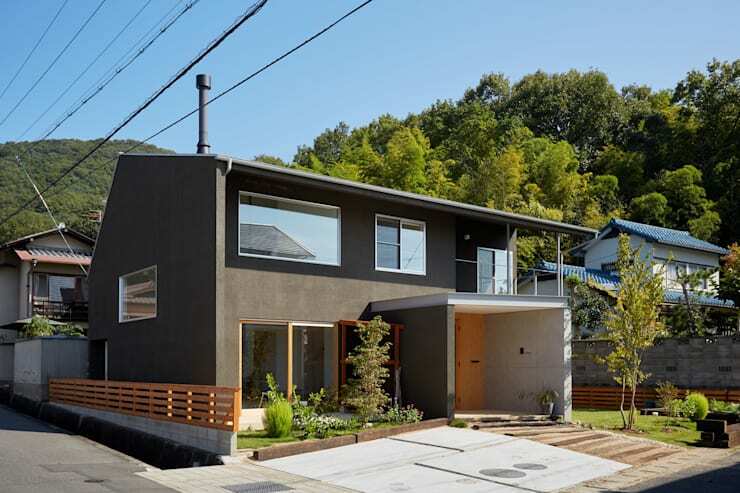 Finally, we love how the front steps and entrance area are set at shifting angles. This creates the sense of a welcoming embrace in the entrance area. The interior has a decor composed of white walls, wooden floors and lots of wooden detailing. The living room here transitions into a dining room and kitchen (out of frame). 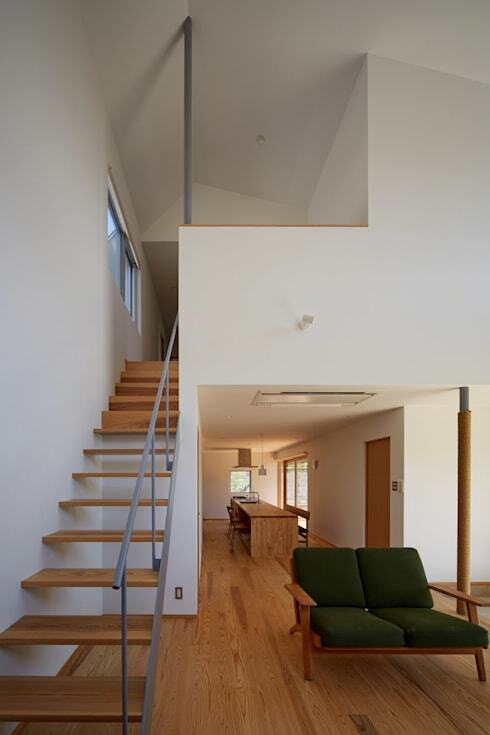 The wooden staircase on the left leads to the sleeping areas. 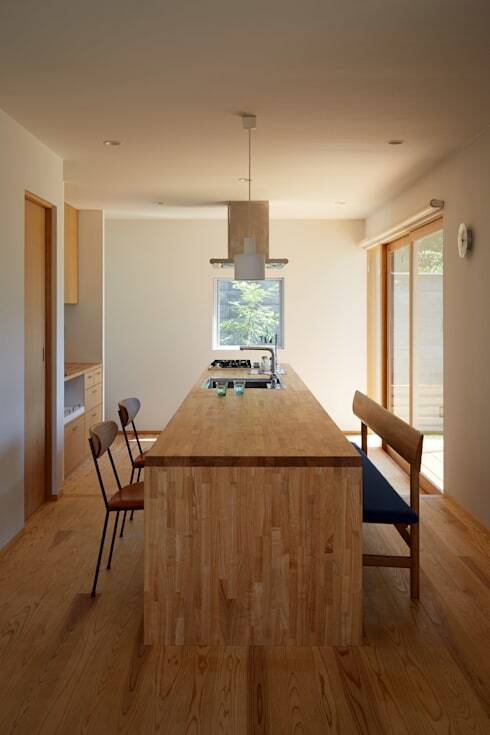 The home is minimally furnished and has an almost monochromatic colour scheme. This all adds to the bright, breezy and elevated feel of the home. The wooden dining area has a beautifully unified decor. The timber table is created with the same materials as the flooring so the eye flows seamlessly up through the space. The eye rests naturally on the small window at the far end of the room. This is the perfect illustration of the power in using unbroken lines of sight. The kitchen is so carefully integrated into the living area that it's easy to miss it! Keen-eyed readers may have noticed that the dining area we explored earlier extended to form part of the kitchen bench we see on the right here. Finally, see how the rather narrow corridor doesn't feel cramped at all due to the large floor to ceiling glass doors on the left. 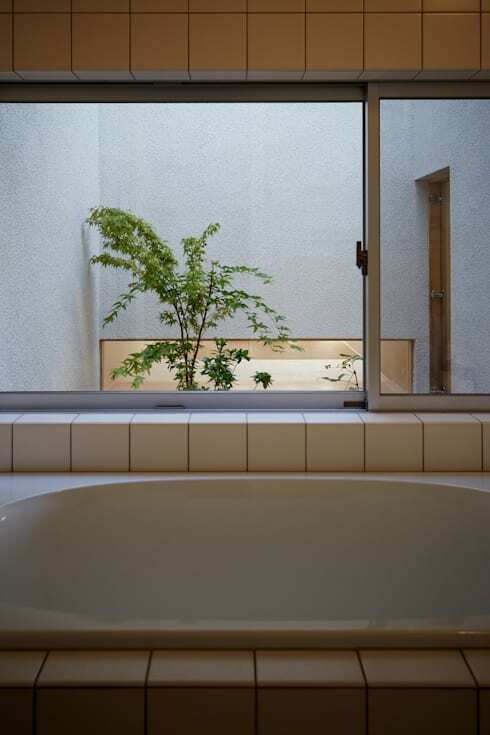 In many Japanese homes, the elements of nature are a key element in the design. This extends from the use of natural materials to the use of courtyard gardens. These can often be enjoyed from the inside of the home. As seen here in the bathroom, the bathtub has been placed to make the most of this view. Natural views like this aren't just there to create a look of luxury, they are commonly said to be installed so home dwellers can enjoy contemplating the beauty of nature. 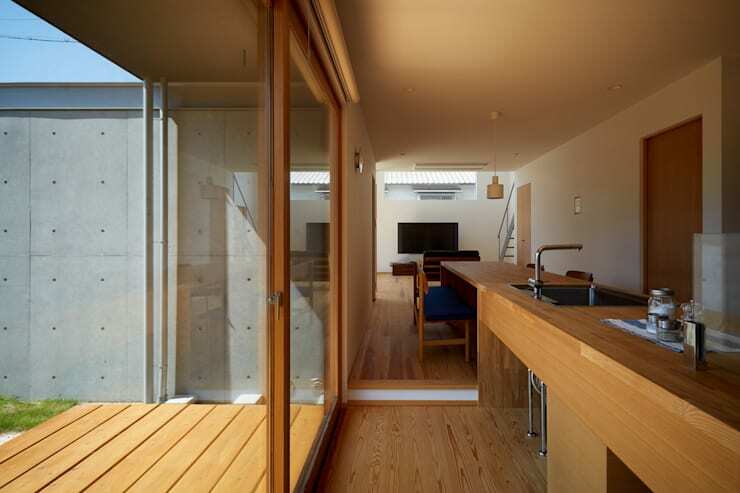 For more natural inspiration, check out The simple wooden house with a difference. Would you like to live in this wooden family home?